Through person centered planning, CTF ILLINOIS gets to know each individual and learn their dreams, desires, and needs. Often the dream is to have their own home. 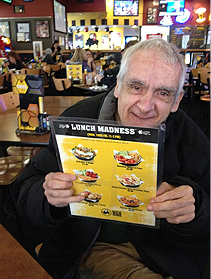 Tim's first time at Buffalo Wild Wings. Individuals who qualify can live on their own and receive services from CTF ILLINOIS through the Intermittent CILA Program. Through this program, adults with mild developmental disabilities live independently in a home or apartment, sometimes with one or more roommates. Services provided to these individuals are individualized and our experienced staff will provide training and assistance as needed with all aspects of living independently, including cooking and cleaning skills, transportation, assistance with medical needs, making and keeping appointments, grocery shopping, paying bills, and similar activities. For more information on the "Intermittent CILA" services provided above, please call 217-352-1557.